(CNS) – The Los Angeles Board of Harbor Commissioners approved a 10-year labor agreement last week that aims for the Port of Los Angeles to continue hiring workers from the harbor area and high-unemployment communities in the city. Under the terms of the agreement, the port must grant almost a third of the jobs generated by most major construction projects to residents of the harbor area and high-unemployment communities in L.A. The new contract doubles the time of the previous 5-year agreement. The LA County Registrar-Recorder/County Clerk (RR/CC) said it has mailed 82,742 Vote by Mail (VBM) Ballots for the Oct. 3rd Assembly District 51 Special Primary Election, adding that there is still time to request a Vote by Mail Ballot. Election officials also announced that early voting has opened at the County Registrar-Recorder’s office in Norwalk, on the 3rd floor. Weekend Early Voting will also be available at the East Los Angeles County Library and Cypress Park Branch Library on Sept. 30 and Oct. 1 from 8am-4pm. VBM voters who choose to vote at their polling place on Election Day must bring their ballot to surrender, or they will be asked to cast a Provisional Ballot. For translated election materials in Chinese, Hindi, Japanese, Khmer, Korean, Spanish, Tagalog, Thai or Vietnamese, call (800) 815-2666, option 3. The 91 dams in Los Angeles County and 40 in Orange County are in pretty good shape, though some could present dangers in extreme circumstances, the state Department of Water Resources announced Sept. 1. The agency’s Division of Safety of Dams released assessment data on 1,249 dams under its jurisdiction that included downstream hazard classification and any reservoir restrictions. The information reflected the most recent physical inspections and “comprehensive re-evaluations” by DSOD engineers and engineering geologists, as well as technical analyses performed by dam owners, according to the agency. “In light of lessons learned from the Lake Oroville spillways incident, we know there is work to do to expand and strengthen our dam safety program,” DSOD Chief Sharon Tapia said. The physical conditions of the dams were classified as satisfactory, meaning no existing or potential safety deficiencies under all conditions; fair, for no existing deficiencies under normal conditions but some risk in case of extreme hydrologic and/or seismic events; poor, where a safety deficiency has been discovered and remedial action is necessary; and unsatisfactory, in which immediate remedial action is necessary. In Los Angeles County, no dams were rated poor or unsatisfactory. However, five were rated as being in fair condition, including Bouquet Canyon, owned by the city of Los Angeles Department of Water and Power; Castaic Lake, owned by the state DWR; Lake Lindero, owned by the Lake Lindero Homeowners Association; and the Santa Anita and Sawpit debris basins, both owned by the Los Angeles County Department Of Public Works. While extreme situations would be needed for the five dams to pose a risk, the assessments pointed out that the downstream hazards to life and property rated as extremely high at Bouquet Canyon and Castaic Lake. More than half the dams in the state have a high or extremely high downstream hazard rating. Dam safety in the state was highlighted in February when the spillways at Lake Oroville were damaged during heavy winter rains. Authorities evacuated nearly 190,000 people because of the resulting danger, but the dam held and water eventually receded. Supervisors has agreed to raise the number of dogs residents can own from three to four. The county Department of Animal Care and Control says increasing the limit will give homeless dogs additional opportunities to find permanent … loving homes and reduce animal homelessness in L.A. County. The increase was proposed by Supervisors Kathryn Barger and Hilda Solis and approved unanimously. The Montebello Unified School District continues under fire as two former high-ranking district officials allege they were fired for exposing political corruption in Los Angeles County’s second largest school district. The suit seeks unspecified damages, compensatory and punitive damages, in addition to reinstatement. The lawsuit alleges Contreras Smith and Pell were fired for looking into the board’s possible involvement in alleged misconduct by Rojas. Pell was a longtime MUSD administrator who has served in various upper-management positions, including co-superintendent. Contreras Smith joined the school district in 2012 and was promoted to co-superintendent in 2013 and superintendent in 2015. Under intense pressure from the community and employee unions, school board members voted about four months ago to terminate Rojas, whose resume and job application it was determined were full of false statements and made-up references. Rojas’ detractors also blamed him for MUSD’s financial woes, which earlier this year prompted the state to agree to conduct a financial audit of the school district. The Los Angeles County Department of Education had issued warnings to the district that it was in danger of not meeting its financial obligations and the county would be forced to send in someone to oversee district finances if board members failed to make significant cuts in spending to shore up an estimated $17million deficit. In response, board members voted to send out hundreds of layoff notices to teachers and other district employees, the majority of which were later rescinded. Angry MUSD employees accused Rojas’ of just months earlier creating a false rosy picture of district finances. Rojas’ alleged actions, if proven, would violate the state’s Public Contract Code and other laws. Rojas’ alleged wrongdoing prompted Contreras Smith to put him on leave and she and Pell brought their findings to the board. EGP reported at the time that the firing prompted someone to create musdcorruption.com, a website critical of the district that claims the two former administrators were actually fired because they tried to take a stand against corruption. EGP reached out to Boardmember Ben Cardenas for comment, but his office cited district policy that they do not comment on pending litigation. The Los Angeles County Board of Supervisors website was hacked Tuesday, with someone substituting a pro-Islamic State group message for links to county information. The site at www.bos.lacounty.gov was restored Tuesday night. “No breach of data occurred and no personal information was compromised,” a county spokesman said. Before county technicians took the site offline, a message was visible in the middle of an all-black screen. Headed by a winged logo with apparently Arabic script labeled Team System DZ, the message carried the headline, “Anti:Govt all word” and went on, “You will be held accountable Trump, you and all your people for every drop of blood flowing in Muslim countries,” according to a screenshot posted by scvnews.com. After going on to warn that “The Arab rulers do not represent Islam” and issuing additional warnings of accountability, the message ended with “I Love Islamic State,” the Santa Clarita Valley website reported. The message was similar to those that appeared on government sites in Ohio, Maryland, New York and Washington that were hacked Sunday and Monday. Those incidents are being investigated by the FBI’s San Francisco field office, CNN reported. FBI authorities were not immediately available for comment. Bell said he understood the incident wasn’t isolated to Los Angeles County and that officials were coordinating with the appropriate law enforcement agencies. The Board of Supervisors voted Tuesday to contribute $1 million to a legal aid fund for people at risk of deportation and confirmed that anyone convicted of a violent felony will not be eligible to benefit from the fund. The eligibility requirements for the county’s share of the L.A. Justice Fund — specifically the prohibition of convicted felons — drew protests from immigration advocates in April and forced the board to cancel a planned vote on the matter. Though the board and other contributors to the L.A. Justice Fund have cited the threat of new immigration policies of President Donald Trump, protesters accused county officials of playing into Trump’s framework of “good” and “bad” immigrants. The board’s vote Tuesday focused on finalizing an agreement with the California Community Foundation to act as the county’s intermediary in granting ,aid. That agreement included an exhibit spelling out the eligibility criteria. — victims of crime, domestic violence and human trafficking. Supervisor Hilda Solis said an estimated 7,000 county residents face deportation proceedings without a lawyer every year. The Boston Immigrant Justice Initiative found that it costs about $5,000 in legal fees on average to contest a civil deportation case. According to a study conducted by the California Coalition for Universal Representation, 68 percent of detained immigrants in California are unrepresented. The same study determined detained immigrants who had lawyers avoided deportation more than five times as often in comparison to their unrepresented counterparts. Niels Frenzen, director of USC’s Gould School of Law Immigration Clinic, said the county’s money would free up other funds for immigrants with prior convictions. The L.A. Justice Fund is aiming to raise $10 million. The county intends to contribute an additional $2 million in fiscal year 2018-19 and the city of Los Angeles has tentatively committed $2 million, an amount approved by a council committee Monday. Los Angeles Councilman Gil Cedillo applauded recent progress in making city funds available to the L.A. Justice Fund. “I am grateful that my colleagues on the Budget Committee recognize the urgency to expend these funds, and hope for the same outcome during the full council vote on Friday,” said the first district councilman in a press release. The city’s criteria also excludes anyone convicted of or appealing a conviction for a violent felony, however, some council members asked for clarification on that point before a vote by the full council. Private entities are expected to contribute the remainder of the $10million and can set their own rules for eligibility. The board’s vote was 4-1, with Supervisor Kathryn Barger dissenting. On a separate front, the ICE out of CD1 Coalition — which includes Cedillo’s office, businesses and community groups — will hold a Legal & Resource Fair Saturday in Highland Park aimed at “formulating the pathway of resistance in Council District 1.” The event will take place from 1p.m. to 3 p.m. at 5601 N. Figueroa St., and will include speakers, legal resources and a live question and answer session. EGP staff writer Natalie Jiménez contributed to this story. Former Los Angeles County Sheriff Lee Baca was sentenced today to three years in prison and one year of supervised release for obstructing a federal probe into corruption in the jails, with a judge lashing out at the longtime lawman and calling him an embarrassment to the profession. 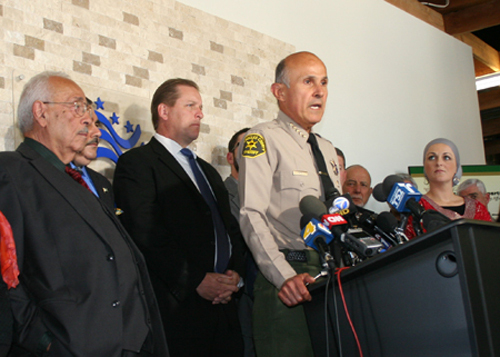 After about two days of deliberations, a criminal jury in downtown Los Angeles – the second to hear the case – found that Baca authorized and condoned a multi-part scheme that now has resulted in the conviction of 10 former members of the Sheriff’s Department. been for the ex-lawman’s health, Baca would have received the same five-year term given to his former second-in-command, Paul Tanaka. deadlocked 11-1 in favor of acquitting the former sheriff, and Anderson combined all three counts in the retrial. Baca did not take the stand in either trial. The charges stemmed from events six years ago when a cellphone was discovered in the hands of an inmate at the Men’s Central Jail. Sheriff’s deputies quickly tied the phone to the FBI, which had been conducting a secret probe of brutality against inmates. sentence of five years behind bars. He was then indicted on the three felony counts for which he was subsequently convicted. The number of children killed at the hands of a parent, relative or caregiver in Los Angeles County rose to 18 in 2015, up from 15 the previous year, while suicides among kids and teens more than doubled, according to reports released Wednesday. The reports on child abuse and child deaths also found that the number of children referred to authorities for suspected abuse or neglect decreased slightly in 2015, and auto-pedestrian collisions caused the most accidental child deaths that year. As part of the reports, county officials recommended that family service agencies, prosecutors and law enforcement begin tracking and reporting data involving children and families impacted by domestic violence. Researchers also recommended that law enforcement share all domestic violence cases with the Department of Children and Family Services when children live in the home. Domestic violence is prevalent in nearly all child abuse and child fatality cases, said Deanne Tilton Durfee, executive director of the Inter-Agency Council on Child Abuse and Neglect, which complied the reports. Children “living with adversity,” including violence, discrimination, cruelty or substance abuse, are most at risk and face life-long repercussions — if they survive, Durfee said. Meanwhile, the reports noted that unsafe infant sleep practices — including bed sharing — and/or unsafe environments accounted for about half of all undetermined child deaths. More than half of the 189 children who died in 2015 were under age 5. The increase in youth suicides in the county from 10 such deaths in 2014 to 23 in 2015 is consistent with national trends that suggest middle school students are as likely to die by their own hand as they are from traffic accidents, according to one of the reports. The youngest children to commit suicide were 13 years old. The most common method was hanging. There was a slight dip in the number of children referred to DCFS, from 181,926 in 2014 to 175,383 in 2015. Officials deemed the county’s Safe Surrender Program — instituted to eliminate abandoned infant deaths — a success, citing the lack of any such deaths last year or in the first months of this year. New cases brought to Juvenile Dependency Court showed a decrease from 2014, and the 15,203 children exiting the system in 2015 was a greater tally than the number of those entering. About 535 cases of child abuse involving juveniles were referred to the District Attorney’s Office in 2015. Prosecutors filed charges in 181 of those cases, with nearly all of them felonies. Officials also called for legislation to require training in recognizing and reporting child abuse as a pre-requisite for medical licensing. “The worst report of child abuse is the one that’s never made,” Durfee said. The Los Angeles Tourism & Convention Board announced Tuesday that a record-setting 47.3 million visitors injected an all-time-high $21.9 billion into Los Angeles County’s economy in 2016. The new visitor spending milestone is $1.3 billion more than 2015’s total, an increase of 6.3 percent, according to the local tourism board, which timed the announcement to coincide with National Travel and Tourism Week. Traveler spending generated $33.6 billion in total economic impact for Los Angeles County, including induced and indirect benefits, according to the nonprofit tourism/ marketing board. Tourism supports 510,500 jobs within the Leisure & Hospitality sector in the region, according to the board, which reported the industry contributed to the addition of 21,400 new jobs last year – a 4.4 percent year-over-year increase. L.A. County’s average occupancy rate for 2016 reached 81.3 percent, surpassing 80 percent for the first time in county history, with a record 29.2 million hotel room nights sold countywide. City of L.A. hotel visitors generated $268 million in transient-occupancy tax collections for the city, which welcomed a record 47.3 million visitors in 2016. Of that number, 40.3 million were domestic visitors and 7 million were international visitors.